Ayrshire-based creative agency Paligap has been appointed to create a new brand for property investment company MAP Global Property Investments, part of the MAP group of companies, which have been helping investors for 27 years. * provide additional marketing material (presentation folder, newsletters, electronic presentations, etc) to support agents as they provide information to their clients. 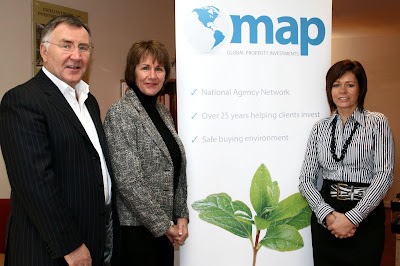 MAP GPI managing director Donald Paterson stated: “MAP were looking to expand our business to a wider customer base. To help us achieve this we required a new image and brand message. We contacted Paligap for an initial consultation and discovered that they very quickly understood our needs. A new look was agreed, a marketing plan established including a new website and marketing material. MAP specialise in bringing their clients unique and alternative methods of investment. The company was established in 2004 and is part of the Troon-based MAP group of companies who have been helping clients buy property for over 27 years. The company strategy is not about selling holiday homes, but to specialise in overseas property investment, which gives clients high rates of capital and income returns. These yields are achieved through the purchase of freehold hotel rooms and third party contracts with tour operators and worldwide travel agents. Paligap is a creative agency that research, plan and create strategic brand building ideas and deploy them across all channels including web, press, TV, radio, outdoor, direct mail and e-mail. There are currently 639 Ayrshire business stories permanently archived on this site. To locate those of most interest to you, please use the site search facility in the top left hand corner of this page. Type your search term in the white box, then click the magnifying glass symbol.